The Virginia Vineyards Association brings together commercial grape growers, hobbyists and others with an interest in viticulture, and its efforts to promote cooperation and the exchange of information is one of the reasons that the Commonwealth’s wine gets better every year. 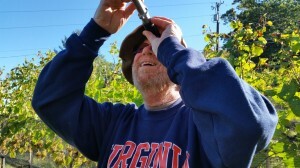 I believe, and I think most of the growers who participated in the association’s technical meeting in Charlottesville last week would agree, that the reputation of Virginia wine is influenced by every bottle that’s sold. 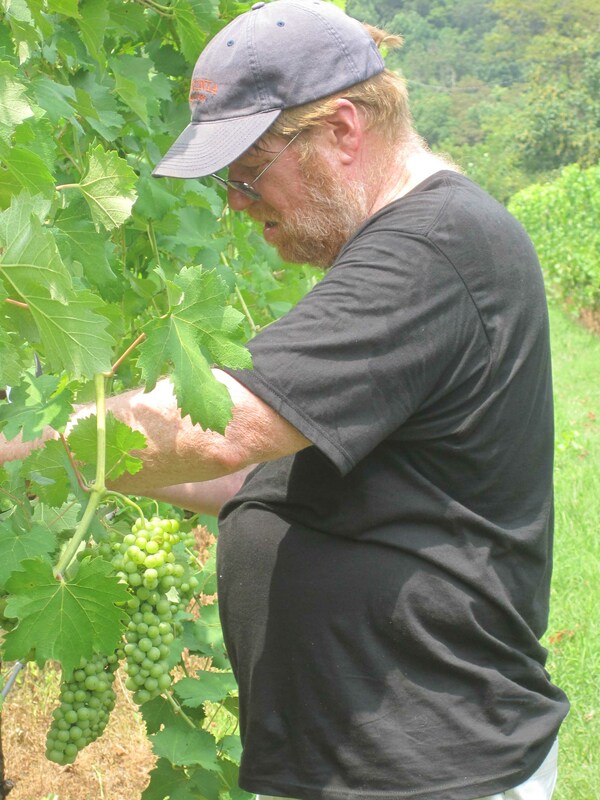 If someone has a bad experience the first time they taste a Virginia wine, they may never try another. 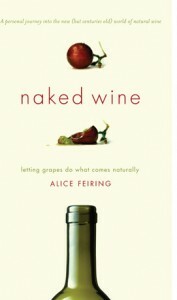 So all of us have a vested interest in doing what we can to help each other make the best wine possible. 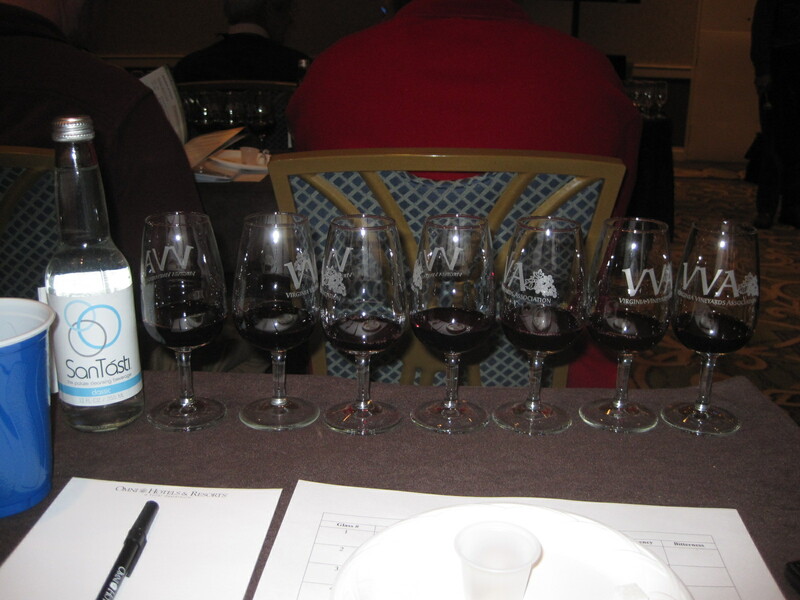 Seven glasses ready for tasting. The bottle of “SanTasti” is a palate cleanser. 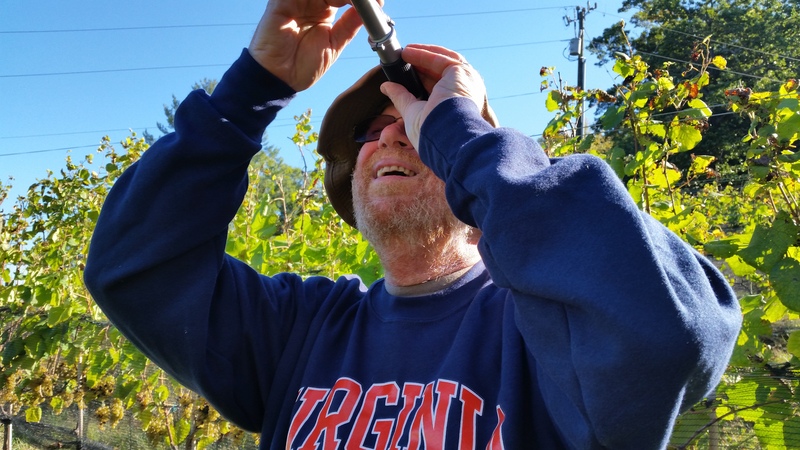 Another reason for the success of the Virginia wine industry is the work that’s being done at Virginia Tech by folks like Tony Wolf, Bruce Zoecklein, and Mizuho Nita, all of whom played major roles at the meeting. 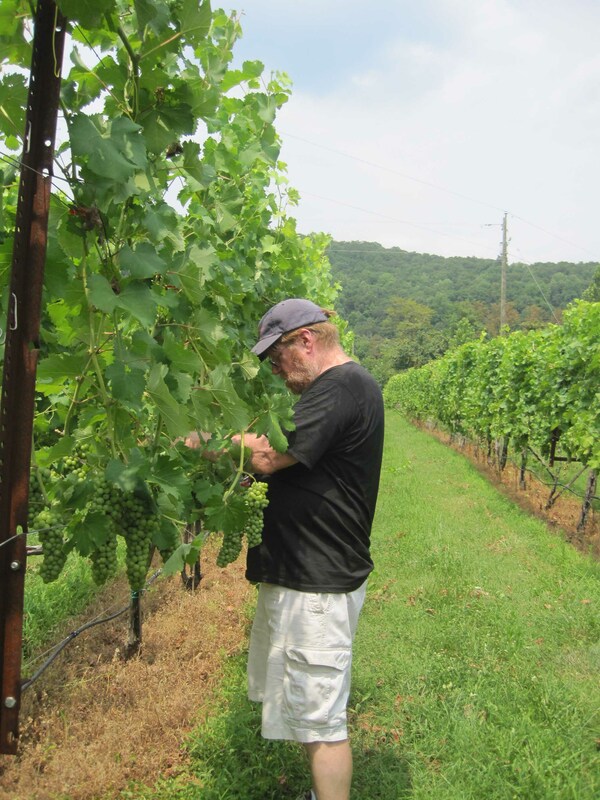 Tony Wolf’s book, Wine Grape Production Guide for Eastern North America, has become our bible as we move toward planting a small hobby vineyard, and Mizuho Nita’s blog is the indispensible guide to grape disease management. 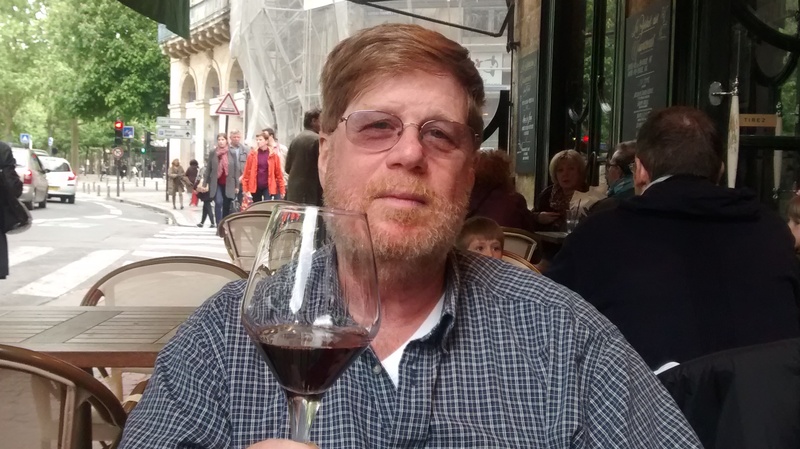 Last week, the UPS truck brought a box of wine from California, reminding me just how late I am in writing something about our tour of Sonoma's Russian River and Dry Creek Valleys. 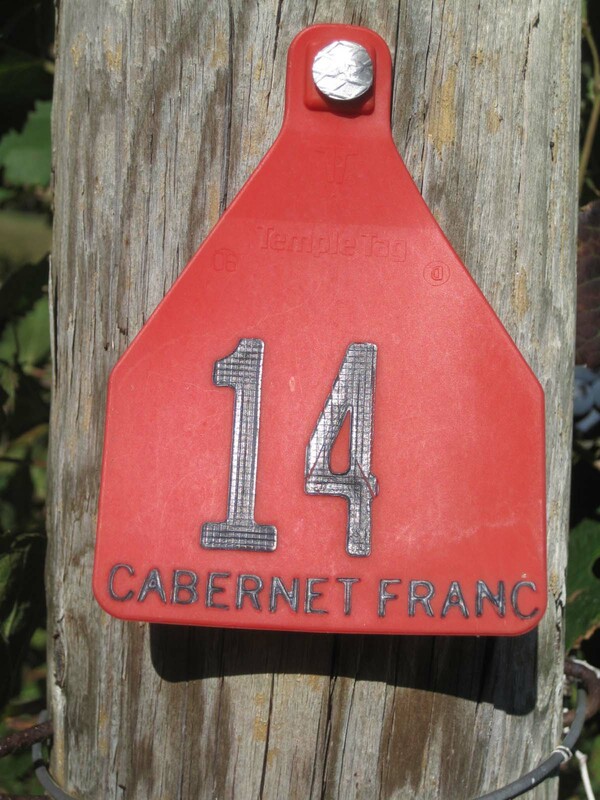 The box contained bottles we had purchased in visits to five separate vineyards, and each told its own story — one of terroir, another of organic viticulture methods, and yet another of vines that were planted in the century before the last one. It was a wonder that we ended up collecting any of these bottles and their stories. 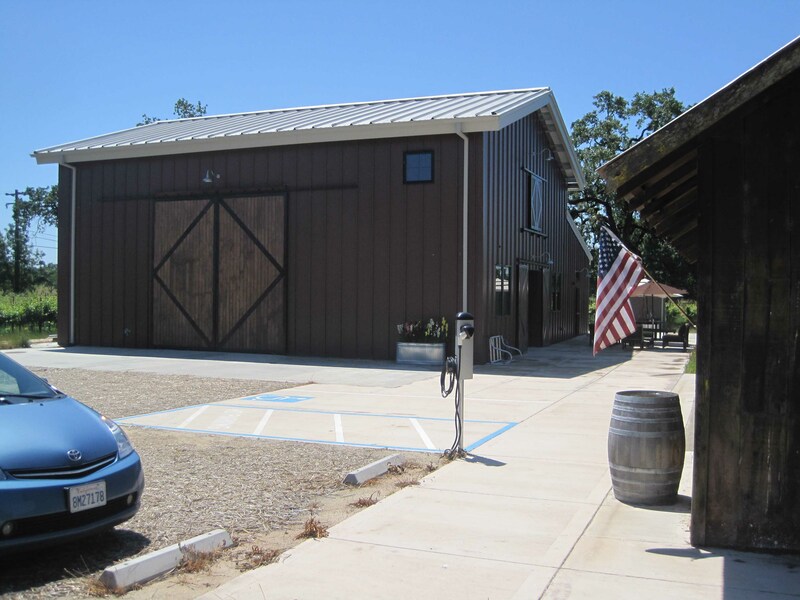 When we first started planning the tour, I had thought we might visit some of the vineyards that make wines I know and like, such as Simi, a Healdsburg-based winery that makes a Cab I enjoy. 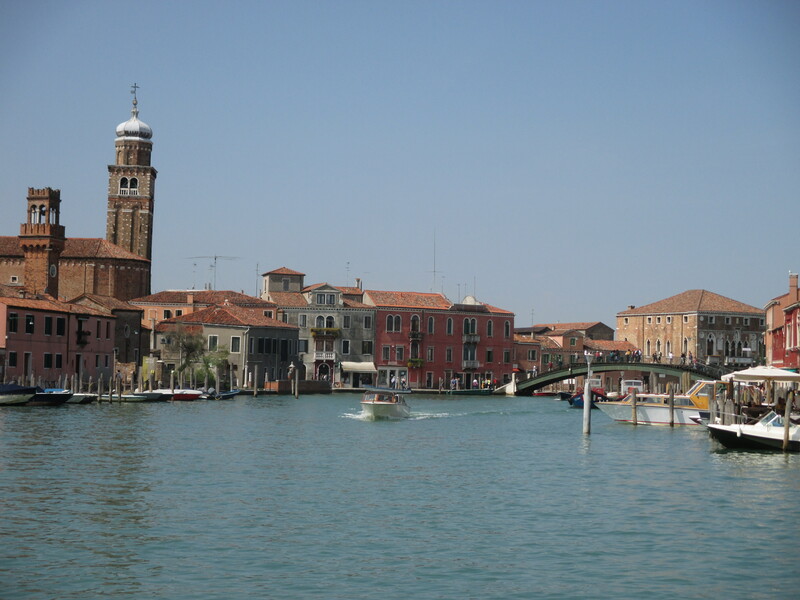 But we signed up with Valley Wine Tours, and in the weeks leading up to the trip, I exchanged a series of emails with our tour guide, Bob Howells, who helped me think through the options. "We can go there," he said about one of my choices. 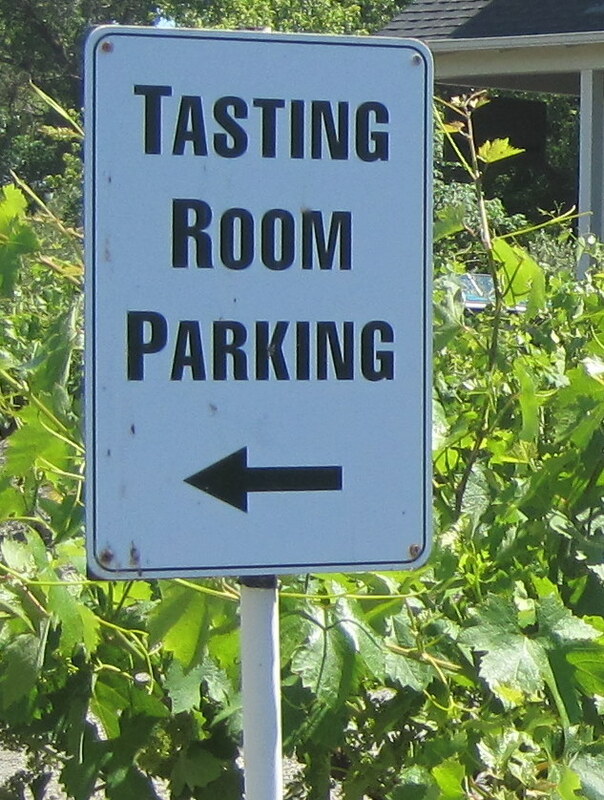 "But it's just a tasting room." That made sense. 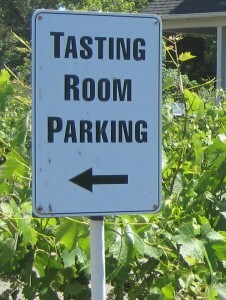 We were looking for something more than another tasting room experience. As we get closer to planting vines (beyond the 14 experimental vines we are tending on two different properties), our primary focus is on educational opportunies. 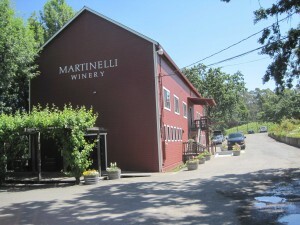 Martinelli converted this lovely barn into a tasting room. What we were looking for on this trip were wineries where we'd have an opportunity to chat with winemakers, vineyard managers and owners. Until my email exchange with Bob, it hadn't occured to me that we wouldn't get that at the larger wineries that ship back to the east coast. After providing that bit of counsel, Bob was extremely helpful in planning our itinerary. I was particularly interested in three Sonoma AVAs — the Alexander Valley, Dry Creek Valley and the Russian River Valley — and he provided a list of six vineyards for each. After a couple of hours of research at Total Wines in Chantilly, I discovered that the wines from these vineyards were generally not available in stores on the east coast. So far, so good, then. We would visit wineries that we would otherwise never experience. We decided to eliminate Alexander Valley, even though it is a great terroir for Cabernet, my favorite grape varietal. We couldn't do all three, and Bob said it would be easier to get the experience we were looking for in the other two AVAs. And he promised we would have an opportunity to discuss wine with knowledgable people who are passionate about what they do. We visted five wineries that day: Martinelli Winery, Inman Family Wines, Battaglini Estate Winery, Talty Vineyards and Winery, and Truett-Hurst Vineyards. We loved them all, each for different reasons and each because it contributed in a different way to our education. 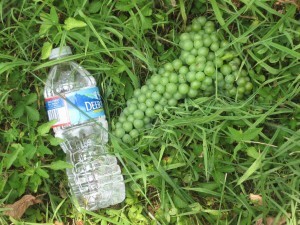 Martinelli, for example — perhaps the largest of the vineyards we visited — was all about terroir. 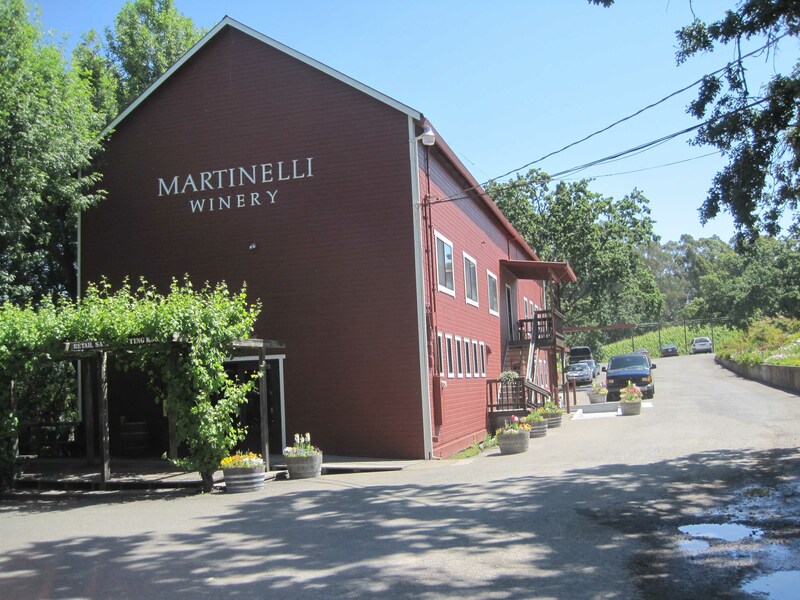 The Martinelli family has more than 300 acres planted, but only 15 percent goes to their own labels, while the rest is sold to other wineries. We tasted Chardonnays from three separate vineyards that are part of their property, and each was distinctly different. 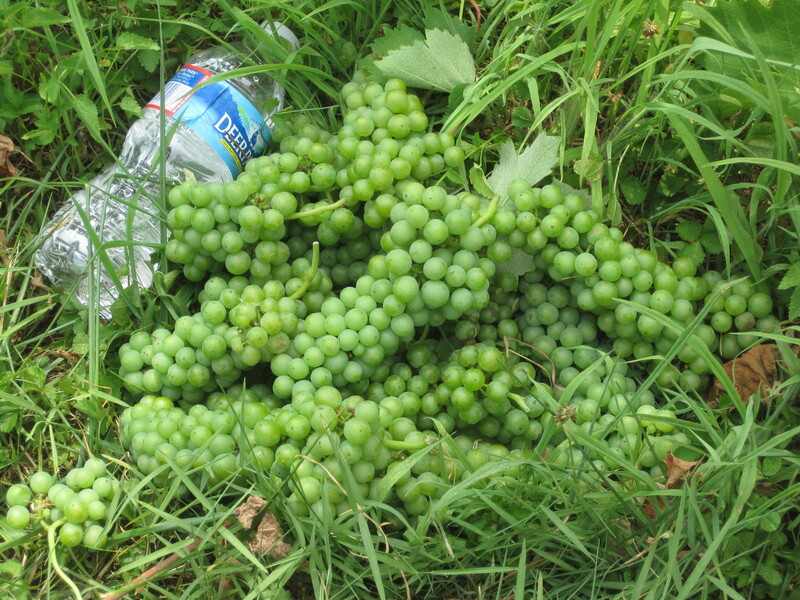 The Woolsey Road vineyard, for example, is a packed-clay soil, and the wine had pronounced mineral notes, while the Three Sisters vineyard, more of a sandy loam soil, featured a much softer, more buttery Chard. While I liked all five vineyards, I'll focus on two here, Inman and Battaglini. Both were extemely generous with their time, and both offered the kind of unique educational experience we were seeking. Inman Family Wines is a small, family-run vineyard and winery focused on the production of elegant Pinot Noirs. 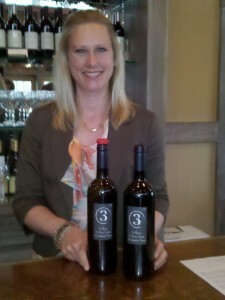 We bumped into Kathleen Inman even before we got into the winery. She was busy arranging outdoor furniture to prepare for the day's visitors, but she took out an hour of her time out to talk to us about the vineyard. Kathleen is big into organic viticulture, and she discussed the organic sprays they use, which are not as easy to find as the non-organic variety and significantly more expensive. 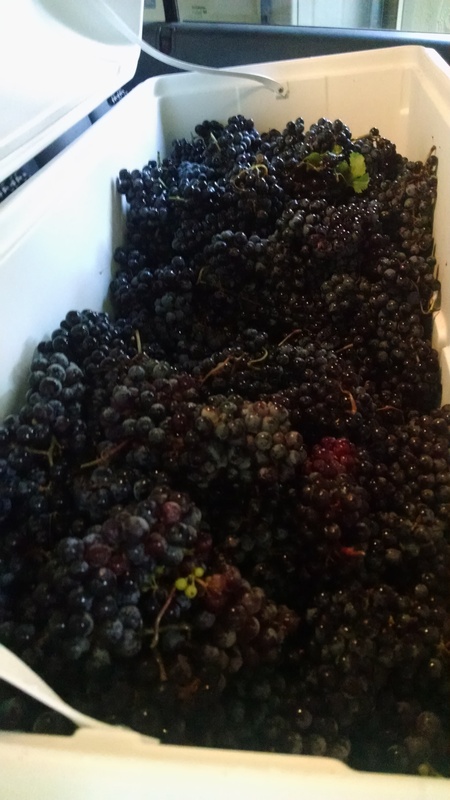 Some of the vineyard consultants I've talked to back on the east coast are dismissive of organic sprays, but Kathleen is getting great results. 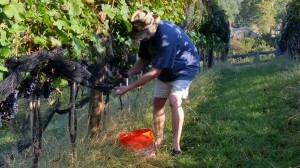 We spent some time talking about canopy management, including her determination to remove all lateral shoots from the vines. Laterals are extraneous shoots situatued just above a leaf, which are in a sense "a shoot coming out ot a shoot." The leaf is valuable, since it contributes to photosynthesis. 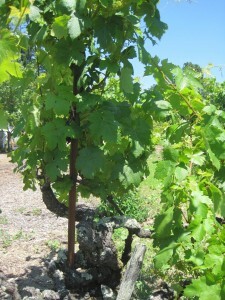 The lateral simply drains energy from the vine. In addition, removing laterals provides a bigger bang for the buck when thinning the canopy. 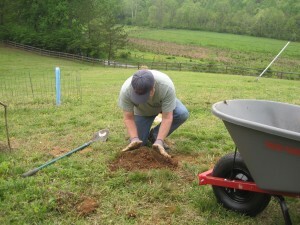 Pulling a lateral removes three or more leaves at once, compared to the removal of a single leaf. Kathleen also showed us the equipment she uses to make "compost tea," a liquid brewed from compost that can be used to add nutriets to the soil or to protect the canopy from disease. Pinot Noir vines just off the patio next to Inman's winery. 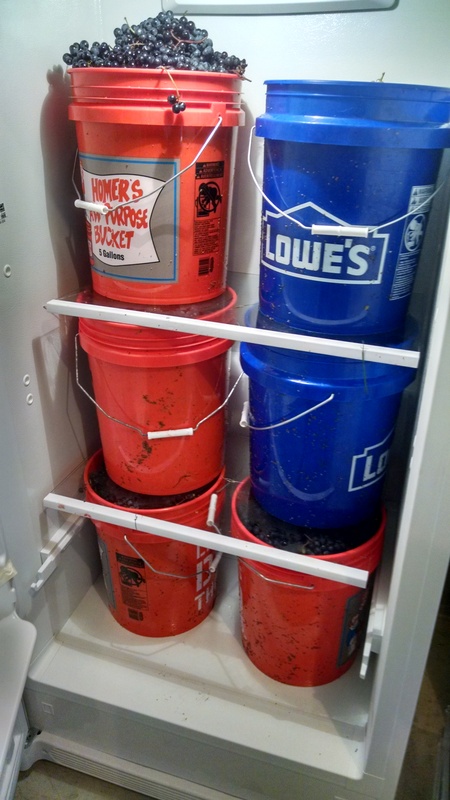 One surprise: To the maximum extent possible, Inman uses natural yeasts, the yeasts that are present on the skin of the grapes. 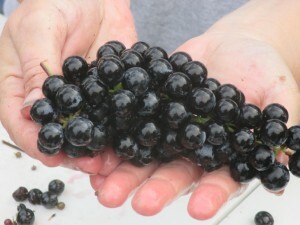 Many, perhaps most winemakers, prefer to kill the natural yeast with potassium metabisulphite, and then add a specific commerically-made yeast to start the fermentation. 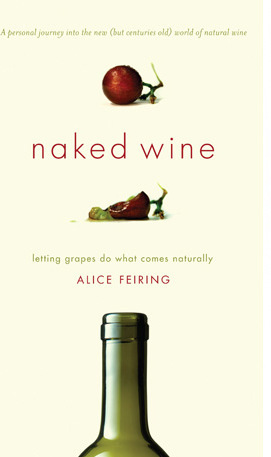 I don't think I would have the courage to rely on natural yeasts, but after tasting the wine, I don't see how anyone can argue with Kathleen's methods. And yes, we finally did get around to tasting. We were thrilled in particular with the Pinots, which were lush and balanced with nice acidity — perfect for food. Pinot Noir is one of the most difficult grapes to grow, and Kathleen's passion for Pinot Noir is clearly evident in her wines. In addition to some Chardonnay, we purchased the 2007 Thorn Ridge Pinot Noir. While I don't pretend to have the world's most sophisticated sense of smell or taste, I picked up blackberry and dark fruit on the nose, and tasted dark cherry in particular on the palate. A fabulous Pinot. Joe Battaglini's tasting room looks like a page out of a history book. Nothing fancy, but the wine and Joe's company are what counts here. At Battaglini, we tasted Zinfidels that gave new meaning to the words, "old vine." 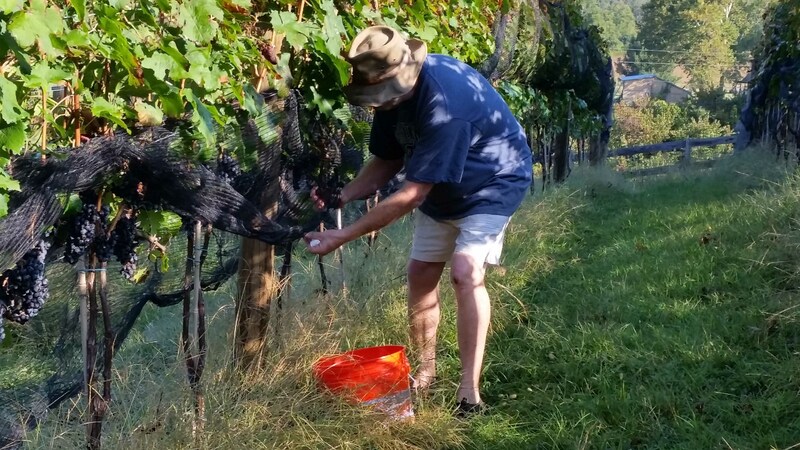 Owner Joe Battaglini, who hails originally from Luca, Italy, purchased 30 acres in the Russian River valley in 1998, inheriting vines that are now 126 years old. 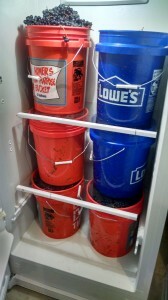 This is a one-of-a-kind operation. 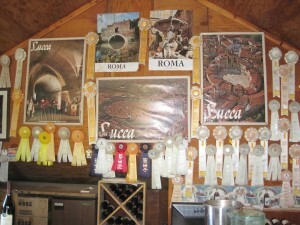 The tasting room is a small corner of what appears to be an old shed, decked out with pictures of Luca, Rome and other Italian cities, plus the many ribbons he's won in wine competitions over the years. After tasting, and before lunch, which we ate at a shaded table outside the tasting room, Joe took us on a tour of the vineyard. 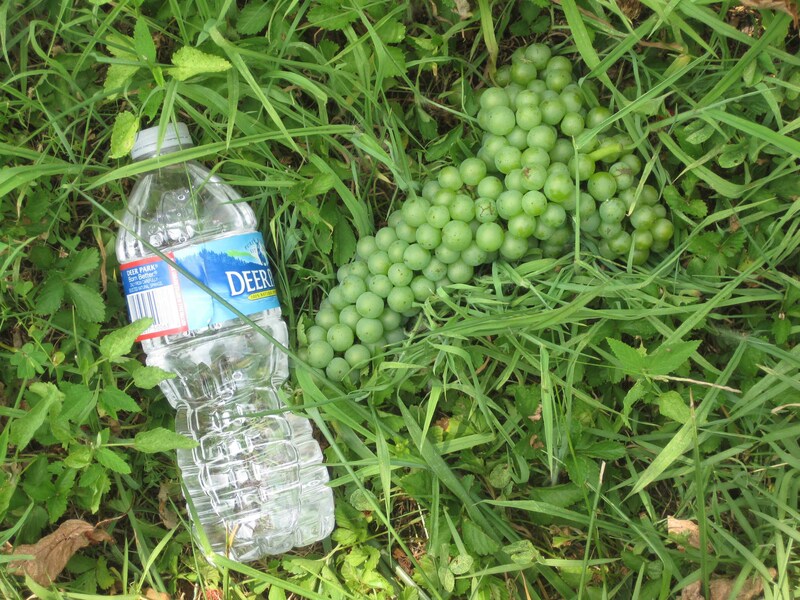 The old vines produce very little in the way of grapes, and a corporate-owned winery would have torn them out years ago in favor of young, higher-productivity vines. Joe dotes on his old vines, even giving them names. One, for example, looks like a huge chair, and so Joe named it "the throne." 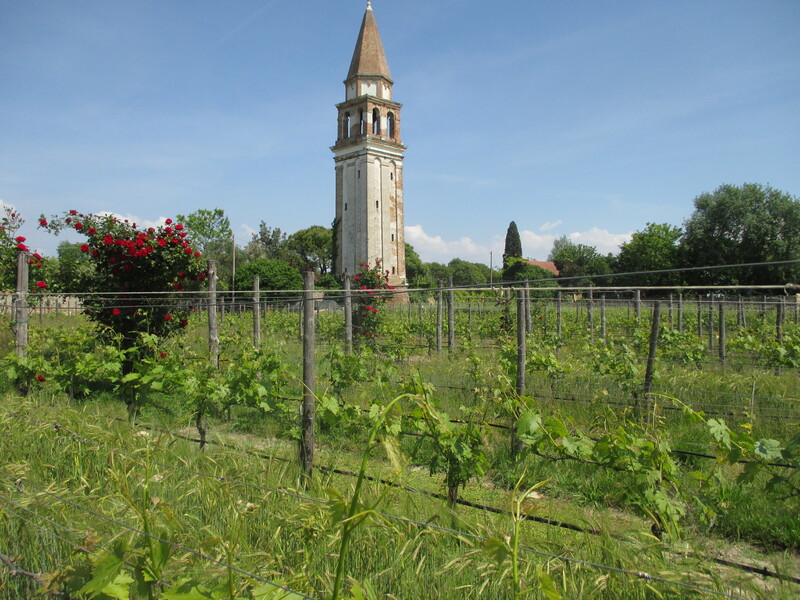 The first thing you notice about the old vines is the lack of trellising. "That's how it was done back then, and how it was when I bought the vineyard," he said. "I didn't want to change anything." 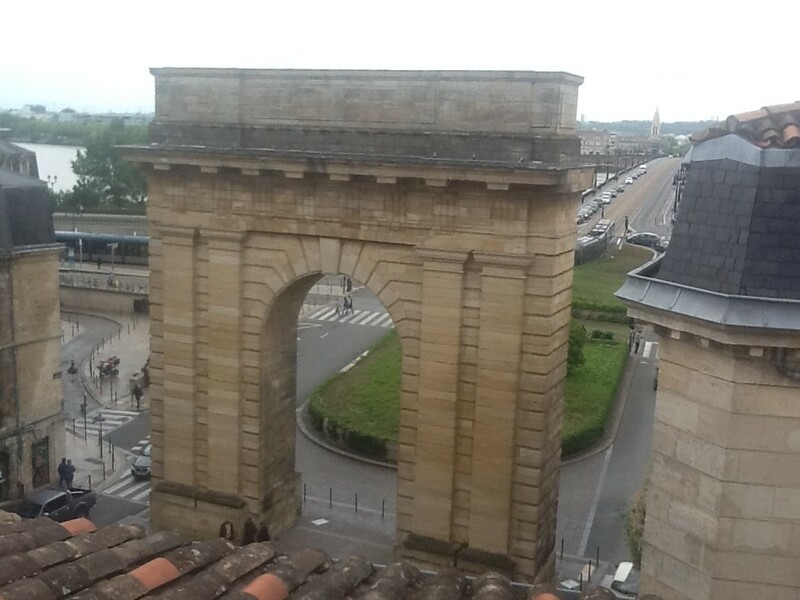 Of course, some things are changing. A modern tasting room is under construction. I suppose it will serve the needs of the winery better, but I can't help but think it will lack the charm of the little shed with the bar and the photos, which remains locked until visitors show up and Joe comes out to greet them. The winery itself is also modern, and after we finished eating the picnic lunch Bob had brought for us, Joe popped out again and offered us a tour. 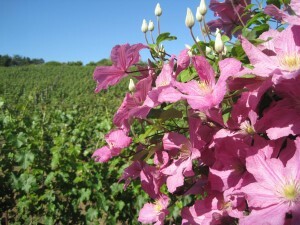 At the winery, you can choose from 28 Zinfandels, six Petite Sirahs and four Chardonnays. Not a bad selection. We bought a half dozen Zins, and have already enjoyed one. They're ageworthy, but I doubt they'll get that opportunity. Me, Joe and the Vineyard Goddess, after a tasting. Finally, returning to the sub-theme of this post, the afternoon before this tour, we passed by the Benziger Family Winery after a visit to the Jack London state park (which includes a great museum, with lots of history related to this uniquely American writer) and decided to stop in. We've been there once before, and enjoyed it thoroughly. 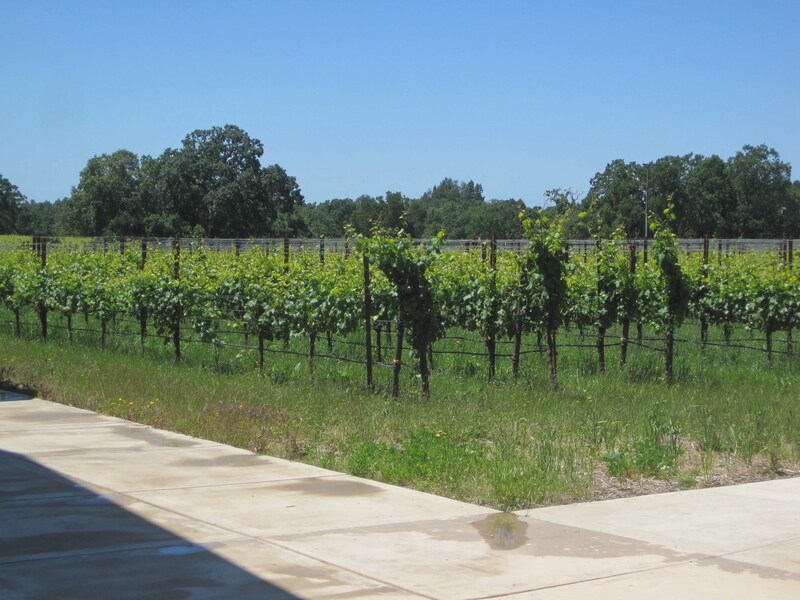 On our last visit, we took advantage of the tram tour, which shuttles you through the vineyard and on to the crush pad, the fermentation facility and the barrel caves. 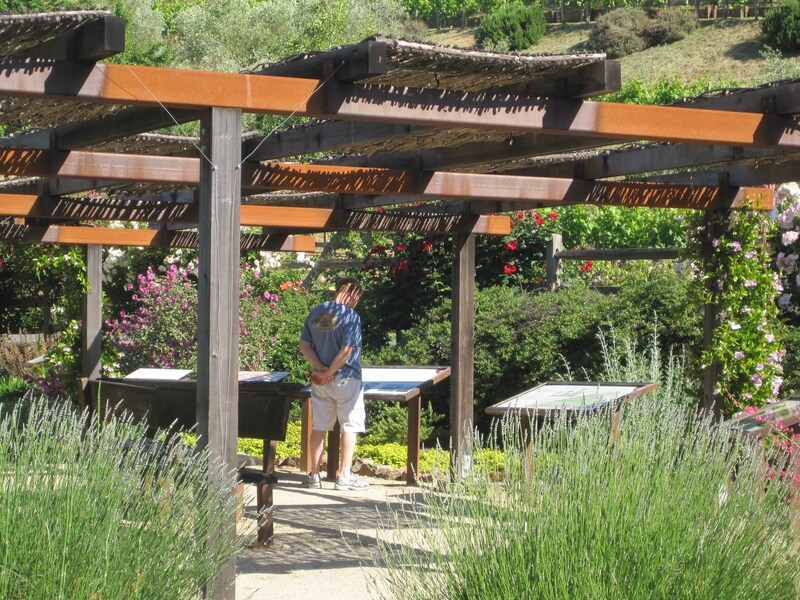 If you don't take the tram tour, you can still wander through the biodynamic vineyard exhibit, a garden-like setting that explains the vinyeard's green approach to growing grapes. 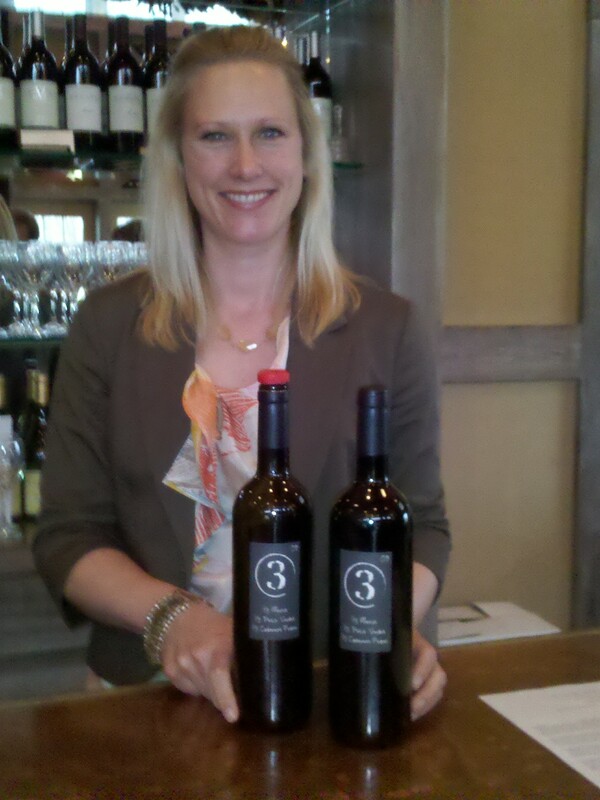 This time, we arrived shortly before closing, and had time for a tasting only. It was $10 (perhaps a bit steep? ), but the wines were good and the setting quite pleasant. Our server was articulate and friendly, and I asked him how long he had been working at Benziger. Thirteen weeks, he said, which explained why he didn't know much more than might have been contained on a script. 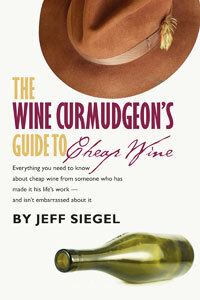 He wasn't bad, by any means, just not knowledgeable enough to go beyond some basics on each of the wines. 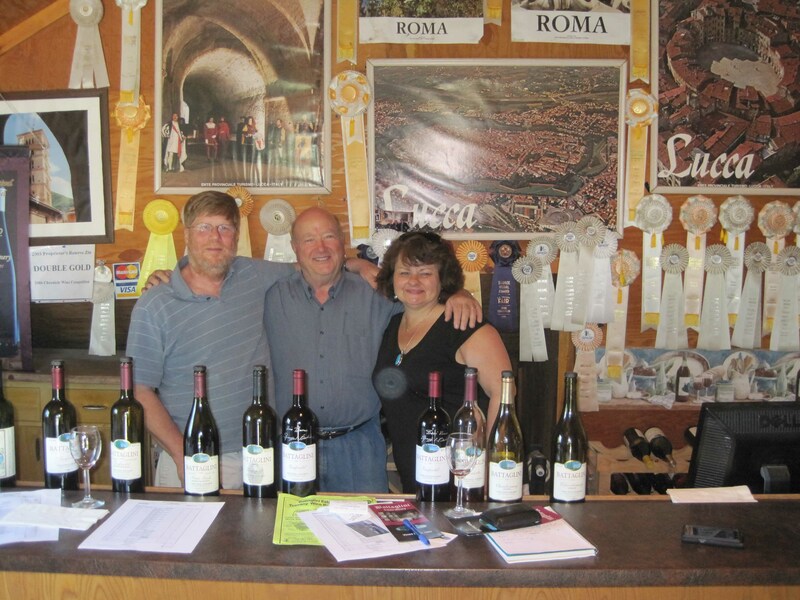 Which made me realize, a day before we began our tour, how right Bob had been in steering me away from a winery I loved that would have been "just a tasting room," in favor of experiences I'll remember for the rest of my life.